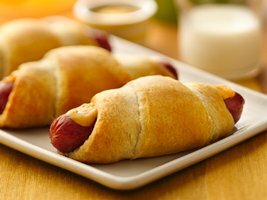 Hot dogs and crescent rolls. What’s not to love? I make these without the cheese because, you know, who needs all that fat? Heh, heh — oh. Dang! Anyway, no matter how you make them, make a lot. They’ll go fast! It sounds like an odd combination, but meatballs simmered in grape jelly and chili sauce are delicious! Low brow maybe, but ach! Who cares? It’s Super Bowl season! Depending on how much time I have, I either make my own meatballs or buy a frozen bag. Either way, this is really tasty party food and they’re ridiculously easy to make. I always hope for leftovers because the longer the meatballs sit in the sauce, the better they taste. Prepare meatballs according to package directions and drain on paper towels, if needed. While meatballs are cooking, pour grape jelly and chili sauce into a large pan over medium heat. Stir occasionally until jelly is melted. Add meatballs to pan and stir until coated. Reduce heat to low and simmer, uncovered, for 15-20 minutes. The longer the meatballs simmer, the more flavorful they get. If using a crockpot, put everything in the pot and cook on low 6-8 hours. You can also make your own favorite homemade meatballs if you prefer. Here’s a recipe I just discovered from Stove Top Stuffing. It’s nowhere near an authentic Italian meatball, but it’s great for this recipe and much cheaper than store bought. Heat oven to 400ºF. Line two baking sheets with foil and spray with cooking spray. Mix ingredients until well blended and shape into 1-inch meatballs. Bake 16 to 18 minutes or until done. One final note, skip the meatballs altogether and use those adorable little mini-wienies. Graceland's kitchen. Home of the Gut Bomb. Question: What do you get when you combine a bunch of bananas, a jar of peanut butter, a pound of bacon, and a big, soft loaf of white bread? Answer: You get an Elvis Presley Gut Bomb, and that’s what I kept thinking about when I stood in Elvis’ kitchen during a tour of Graceland. Sure, he’s the King of Rock ‘n Roll, and, yes, he had a tremendous impact on our music and pop culture, and it is true that all these years after his death, thousands upon thousands of loyal fans still make the pilgrimage to his Memphis home. I don’t disagree with any of that, but as I stood in his kitchen, looking at the dark wood cabinets, the linoleum countertops and the stained glass overhead lamps, I thought of Elvis in his pajamas, frying up a Gut Bomb for himself and whoever happened to be hanging out with him. Visiting Graceland didn’t put Elvis Presley up on a pedestal for me. It took him down from one, and made him accessible in a very endearing way. It wasn’t just the Gut Bomb that did it, either. The house itself, did, and the property around it.